The coastal village of Happisburgh offers our guests a countryside location, sandy beaches and cliff top walks. The large grain barn and stables at Church Farm have been converted to retain character and create four exceptional holiday cottages, which all have exposed flint walls and old beams. Each cottage has its own door allowing direct access into the shared recreation barn with a racket sports area, a pool table, table tennis table and sitting area with books and games. There are footpaths, cycle ways and byroads to explore with easy access to a large number of tourist attractions and many of Norfolk's superb bird watching sites. Access to the Norfolk Broads is less than 10 minutes drive away. Open all year. Integral recreation barn accessible from all four cottages, providing racket sports area, table tennis, pool. Comfortable seating area, books and games. 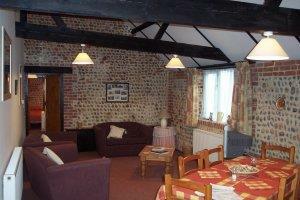 Easy access to the broads, numerous tourist attractions, the beach, local footpaths, coastal walks and leisure centres. Children welcome from any age.